The first season of the seventies TV series Lou Grant debuts on DVD this week. To mark the long-awaited debut, Parallax View is featuring a pair of pieces about the series originally published during the run of the series. The first piece was published on Monday, May 24. My wife just told me that Lou Grant is going to be on in Lou Grant‘s time slot this week. This is something new and different. It had looked as if CBS, not content with having cancelled one of the best dramatic series in television history, wouldn’t even let it die in its own bed: for the past few weeks, the 10pm Monday berth has been consecrated to pumping ratings life into a piece of dreck called Cagney and Lacey. Lou’s fans had begun to wonder whether they’d have a chance to bid him farewell. Quality in television scored one of its rare victories that season: Lou Grant survived despite slow-building ratings. On ABC or NBC it would have been chopped after thirteen weeks, if not sooner. But CBS had a tradition of nurturing distinguished slow starters (including The Mary Tyler Moore Show where Lou Grant, if not Lou Grant, had been born). The network remained patient. Critics spread the word and so did more and more regular folks. The show’s viewing strength grew. Come one miraculous week in the summer of ’78, a Lou Grant rerun copped number-one position in the Nielsens and Ed Asner beamed at us from the cover of People. I breathed a sigh of relief along with Lou’s other fans, but remained apprehensive. That summer fluke aside (what else was there to watch that week? ), the program’s numbers weren’t that great. Any time I happened to notice the weekly top 10, or even top 20, shows listed in TV Guide, Lou Grant wasn’t among them. Although it was being spoken of casually as a “hit,” and had begun to be treated like an institution, the possibility of permanency still seemed remote. A network can’t make big bucks off an only moderate hit, no matter how regularly it wins Emmys for its star (1978) or itself (1979). 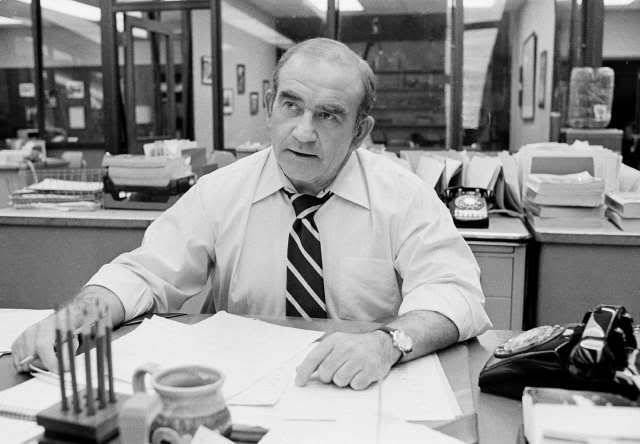 Lou Grant won Emmys for both Ed Asner and itself, as well as for several more series contributors, in 1980. In the era before Hill Street Blues, it was what was considered a sweep. As the ironists ex machina would have it, the 1980 Emmy Awards also marked Asner’s decisive emergence as a political force in the Screen Actors Guild. In sympathy with an industry strike then in progress, he engineered a 99 percent boycott of the awards ceremony that left TV viewers looking at a hastily assembled, tuxedoed and begowned audience of producers’ and network staffers’ in-laws. Along with his latest Emmy, Ed Asner had earned his first resentment from the TV industry’s movers and shakers. And El Salvador and internecine SAG warfare with Charlton Heston were still over the horizon. So was Lou Grant sabotaged by CBS? Could be. It didn’t help that every other week this year, it seemed the program got bumped by the 27th country-music awards gala of the season. But other factors obtruded as well. For one thing, a segment of Lou’s core audience was made up of people who “don’t watch television” except for the one show they make a point of watching. When Hill Street Blues came along, assimilating the virtues of Lou Grant and carrying its experiments with open-ended, multilevel narrative and credibly flawed characters still further, some of us delighted in having one more worthwhile series to watch. Others who previously had watched Lou and only Lou simply adopted Hill Street as their single televideo habit. But Lou Grant had developed problems of its own before Hill Street arrived to out-dazzle it. When the program returned for a second season, many observers and not a few members of the cast and crew exulted that now the show was “a hit” it could afford to be even more Serious, to tackle Issues forthrightly. Their confusion of issue-mongering with seriousness is all too common a misconstruction. The truth of an art experience is a matter of texture, not avowed subject or didactic intention. Lou Grant‘s genius that first season had been for seriousness without problem-piece pedantry, just as it had been for geniality without smarm. The show had an infectious quality I’d have to call a low-key verve, which sprang from a witty perceptiveness about people and the social systems they get caught up in, whether on an urban/national/global scale or within the expanded family of the workplace. Capital-I Issues entered the show’s world and were treated intelligently, but what mattered most was how these issues impinged on the lives of characters whose ever-evolving dynamics as individuals within a community were the real story. That is, among other things, the aesthetic justification for series television. Lou Grant never lost its salty sense of characterization or the no-sweat ensemble acting of a first-rate cast, but for a couple of seasons it veered perilously close to the issue-of-the-week syndrome. Again ironically, it was only in this latest, and sadly last, season that the show seemed to have triumphed over that syndrome. Several of the year’s episodes have ranked with the series’ best, achieving topical validity while deepening the fine observation of emotion and behavior that measures human growth. Lou Grant has probably received more press for getting cancelled than it has in the five years it’s brought quality to the video wasteland and, incidentally, pointed the way for subsequent (Hill Street) and undoubtedly future successes. Because it was a succès d’estime rather than the solidly popular phenomenon a show needs to be to stay on the air, the fervent, Ralph Nader–led campaign to urge a reconsideration of the network’s decision will probably avail nothing. 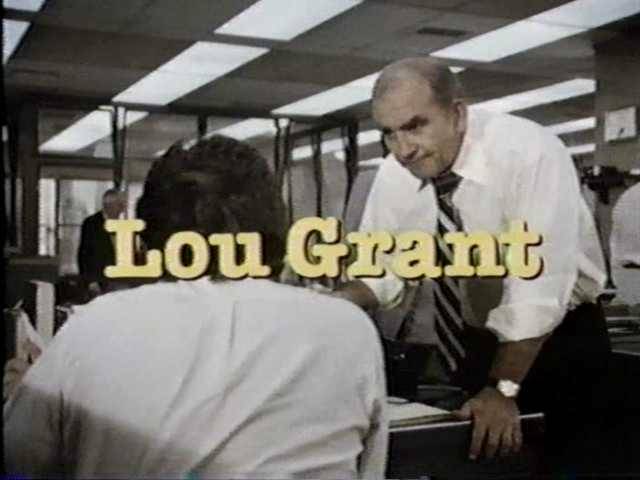 But as it leaves, we can still say of Lou Grant what we said in those hopeful first weeks in the autumn of 1977: it’s one of the best things television’s ever done.